The S&P 500 ended a solid year with a third weekly loss in the past five, trimming its 2016 total return to 11.96%, its strongest annual performance in two years. Also inclusive of dividends, the Dow Industrials surged 16.50% in 2016, its best year since 2013, while the NASDAQ Composite returned 8.87%. Treasuries capped its second straight weekly gain since the election, ending the year at 2.445%, up 17.5 basis points over the past 12 months. The last week of the year was marred by mixed economic data and geopolitical tensions. President Obama announced a series of strong sanctions against Russia, expelling 35 suspected spies from the U.S. and closed Russian conclaves in response to alleged computer hacking surrounding the U.S. presidential election. Investors had also turned cautious, recalling a five-year trend whereby the S&P 500 reversed direction in the first week of January from a typical bullish orientation during December. For the week, the Dow Industrials fell by -0.86% for its first weekly decline since the election, the MSCI EAFE (developed international) increased by +0.61% and, the S&P 500 fell -1.08%. With the Dow Industrials flirting with the 20,000 level, CFRA/S&P reminds us that millennium and century marks on major stock indices have traditionally acted like rusty doors, requiring several attempts before finally swinging open. Therefore, it should come as no surprise if stocks take a breather to digest recent gains. However,CFRA Chief Strategist Sam Stovall said individual investors may be inclined to sell in the New Year, as they would likely prefer to trigger a taxable event when their obligation to Uncle Sam may come at a lower rate. In Chart 1 above, CFRA/S&P shares its 2017 quarterly earnings forecasts broken down for each of the 11 major sector groups. Quite notable is the huge triple-digit earnings growth within the Energy sector and the four instances of red-colored earnings slowdowns forecasted for Industrials, Telecom and Utility sectors. 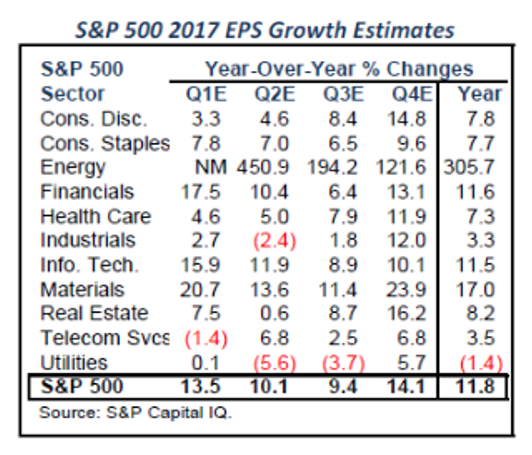 On an overall basis, CFRA/S&P is estimating 2017 earnings growth of 11.8% for S&P 500 companies.